Today is March 2nd. My due date is April 2nd. Yep, that’s exactly one month! I’m trying to stay in the mindset that I’ll be late because that way I won’t be surprised if I go to 41 or 42 weeks, but who knows? One week from Monday I’ll be considered full term, so at that point we could have a baby at any time! This is my new favorite dress. It’s from Target, but I couldn’t find it online. It’s super comfy and really shapeless, but with a cute cardigan and belt over the belly, it looks pretty cute, in my opinion. Plus, I should be able to wear it after baby with the belt at my waist (imagine: a waist). This is the first week where I’ve thought I might not actually make it working until just 3 days before my due date. I’m starting to have a lot more trouble sleeping (last night I was awake from 1:30am to 4am) and it seems like each day I develop another ache or pain. Tuesday, my right hip hurt so bad I could barely walk. Then this morning, while I was walking down one of the many sets of stairs to my classroom, I felt a sharp pain in my right knee. I looked kind of silly hobbling down the stairs, but it went away a few hours later. The nursery is almost done! We’re in the process of hanging art and working on some toy storage, but I’m hoping by next weekend it will be ready for pictures! I have to admit, I never understood when women who were at the end of their pregnancy said they were done being pregnant. I’m starting to get it, now. I think I could be six or seven months pregnant forever – I really had such an easy first and second trimester. But I’m not sure anyone really enjoys being 8.5 to 9 months pregnant (I’m 9 months on Monday). I’m still not ready to be done, but I’m getting closer. 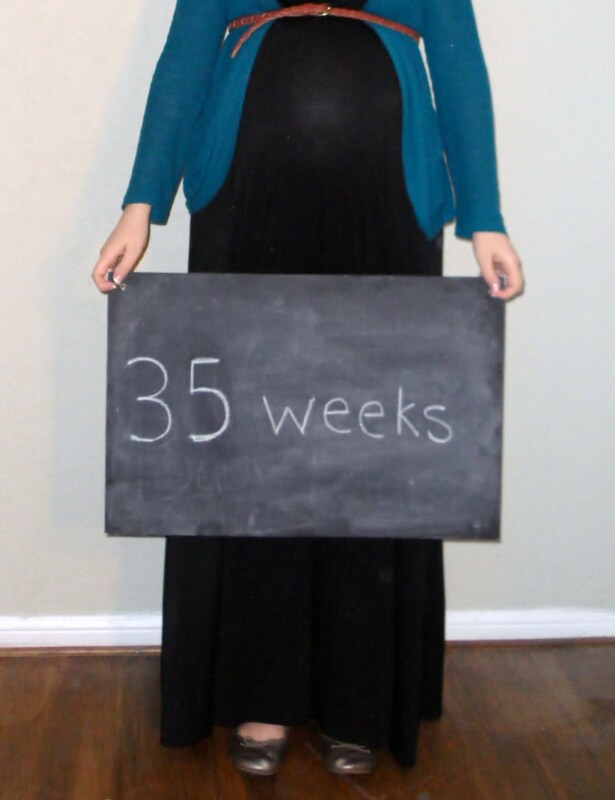 If I could stay at the 7 month stage for the whole last trimester, I’d love it. My birthday is on Tuesday! It’s also the same day as my work shower, so I’m excited for a fun day. Actually, it seems like I get to celebrate quite a few times this year: my husband and I are celebrating this Saturday, I’m having brunch in Malibu with my best friend on Sunday, then my parents are making us dinner on Sunday, and I’m going out with some great girl friends on Tuesday! I’m feeling pretty lucky. Wow! That kinda freaks me out!! Glad everything is good with her and the baby! Don’t feel too bad about not wanting to be pregnant anymore. It happens to most women. 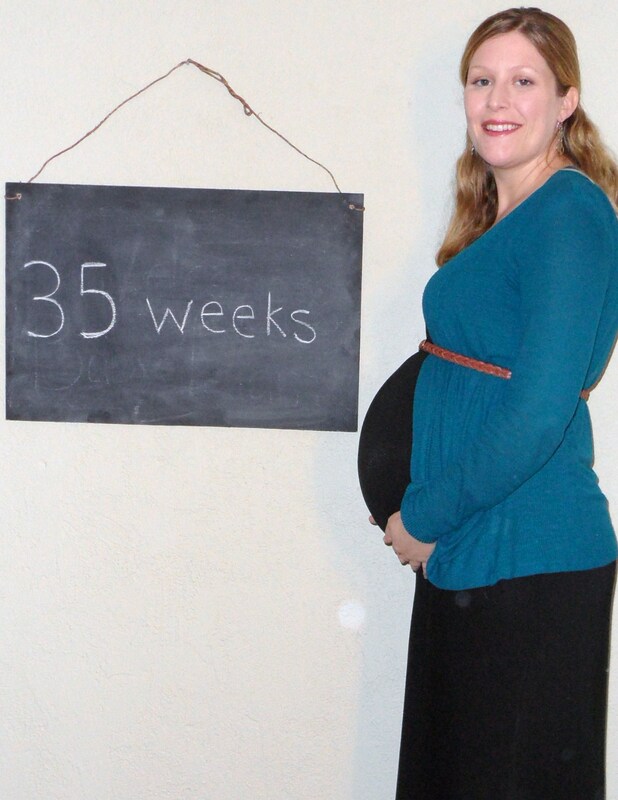 There is something wonderful about being pregnant but it can also be uncomfortable. I knew that morning sickness was good in a way because it meant I was making the right hormones (throwing up not fun). I loved feeling my children move in my body knowing that I had a little baby in there (when that baby kicked me in ribs so hard I lost my breath it was a little irritating). I like watching my body change to make room for my babies (my hips and back KILLED). There always seemed to be great but uncomfortable things going on. Plus who doesn’t want to meet their precious little one. I can’t believe in about a month Liam will be here! It’s HERE! I know at the end of my pregnancy with Carter my whole body felt like it was falling apart. My knee gave out at 39 weeks and I couldn’t walk at all, it was torture. Even though I love being pregnant, the last few weeks are really hard. I hope you go a bit early!!!!!! So excited to meet you baby Liam!